In this episode, a little girl gets possessed by spiritual forces and entices monsters to do her bidding. Isn't that the plot of The Exorcist? Set aside the fact that the powers at work here represent the greater good. Some sort of spiritual entity is taking over Kari here. Something with the power to grant so much energy to other Digimon that they are actually uncomfortable receiving it. Something with the power to lead Sora and TK through a labyrinth to find Tai and Izzy. Something with the power to inspire hundreds of hapless Numemon to sacrifice themselves to protect her. I think we're beyond a simple fever here. Until now, the whole “power of the crest” thing hasn't been complicated. Everybody has an assigned trait. When the trait is demonstrated, the crest glows. When the crest glows, your Digimon gets more badass and wins. The Crest of Light, apparently, works a bit differently. Demonstrating the trait of “light” is a little more ambiguous, but apparently Kari fretting over the enslaved Numemon is close enough. Forget something simple like making Gatomon digivolve. Kari seemingly turns into a full-fledged goddess. A scary one, at that. It's not just the crest that glows. Her entire body radiates light and everybody (that's not a giant evil teddy bear) is touched by it. The Numemon are instantly smitten, cast off their shackles and begin worshiping her. All of the team's Digimon, exhausted and unable to evolve, regain their energy in an instant, evolving whether or not they want/need to. WaruMonzaemon doesn't have a chance against them. 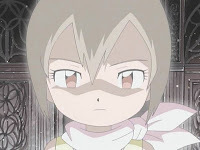 Kari knows instantly how to find the others and, after a brief reunion, stands against Machinedramon as the Numemon attack him. He disposes of them instantly, such an unholy act that she wails out and summons WarGreymon to slice him up Kenshin-style. One hit, one more Dark Master out of the way. What's even more frightening is that Kari is doing this willingly, and appears to be fully conscious of what's going on. Her ability to accept all this is unmatched through the seasons, although the ramifications of all this light bearing will be examined more deeply next season. What really makes this episode shine (pardon the pun) is that even with all this freaky Kari manipulation, there's two more angles going on. When they're not blinded by Kari's light, TK and Sora step up big time. After they land in this expansive underground realm, TK's the one who watches over Kari, staying with Gatomon while his own partner looks for the others. Finally, he can show concern and look after somebody else, rather than having everybody fretting over him. Sora... spends the episode fretting over TK. But this is a new role for her and she does it in awesome fashion, occupying WaruMonzaemon while Kari does her thing with the Numemon. At one point during the ensuing chase, she even carries TK like a football. It's an amusing diversion from all the heavy stuff. As for Tai and Izzy, Tai has fully abandoned his “Don't Be Matt” policy regarding his concern for Kari, endlessly marching his team through the sewers trying to find her. 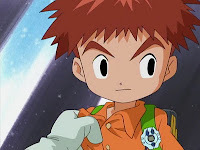 With Agumon and Tentomon on the verge of collapse, it leads to a huge moment for Izzy when he stands up to Tai and demands that they rest. Let's make this clear: Izzy never loses his temper and he rarely questions Tai's decisions. Izzy stands his ground here, and Tai responds in kind by tackling him and punching him in the face. And yet, even in this moment of contention, Izzy's loyalty to Tai shows through as he brushes off the physical violence, knowing it's just Tai's frustration over Kari and nothing personal. This pays off as they transition to fake fighting to take cover and spy on a passing intruder... Andromon. Numemon aside, it's interesting that as Andromon engages Machinedramon to help the digidestined, Angemon and Angewomon go out of their way to keep Andromon alive, ultimately succeeding despite taking some nasty hits in the process. 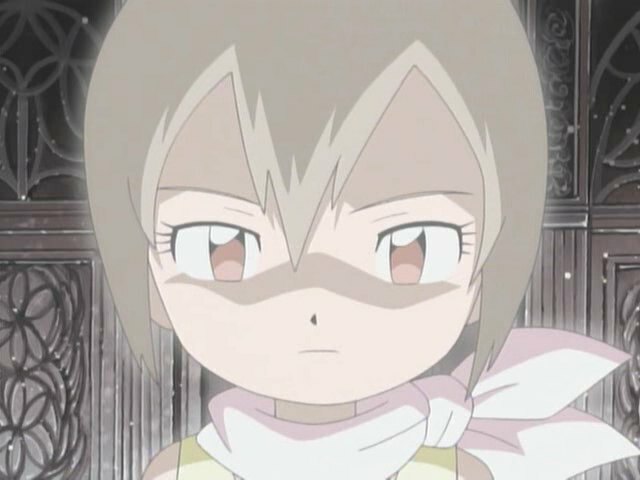 Remember that Mimi left the group because she didn't want to see any more Digimon die, yet had to witness Leomon sacrificing himself. The remaining five soldiered on in spite of the losses... yet the first time a Digimon threw himself into the fight, they put his safety above everything else. Different paths... same sentiments. It's commented that this underground world is a composite of sewer systems around the world, mirroring the city above them. Honestly, I can't picture sewer systems being this massive and open. It looks more like a network of palatial subway stations. Dig the graffiti though. There's another Gotsumon/Pumpkinmon-style non-killing in the dub here where Machinedramon clearly blows up WaruMonzaemon. In the dub, he cries that his arm got blown off because that's all we see... even though it's deleted moments later. Silly dub. The disparate reactions Biyomon, Patamon, Tentomon and Agumon have when they fail to evolve are amusing, particularly Agumon's boasting. Does he think that every time he turns into Greymon? Tai asks Izzy to punch him back to make up for their fight earlier. Izzy refuses, but Agumon and Tentomon want to take a swing. After all, they're the ones he was wearing out. After WarGreymon does the samurai-esque delayed slice move on Machinedramon, he reverts back to Koromon. Koromon appears to have a scar across his forehead... which would also be considered samurai-esque. Did you know that machinedramon survived this encounter, and went on to become millenniummon? And considering that millenniummon conquered the digital world twice, split it in half, released Apocalymon (effectively creating HIMSELF) along with all the other villains of the first series as well as creating the dark seeds that would infect ken, thus being responsible for EVERYTHING that went wrong in the adventure verse, and that he nearly took over the entire universe but still got what he wanted, your assessment that he is the best villain is entirely correct. My question is where the hell did that 1st Kimeramon come from, and what made him Jogress Shinka/DNA Digivolve with Machindramon. This is assuming you take the supplementary material as canon. As far as the anime for season one was concerned, Machinedramon died in this episode. Surviving getting sliced to bits seems a bit ridiculously convenient, anyway. Milleniummon DID NOT release Apocalymon. The whole story of Milleniummon's story being a time paradox is a big error. Ken DID NOT create Kimeramon. He just recreated him. Kimeramon had already exist in the past. It was a previous Kimeramon who fused with Machinedramon. With Machinedramon's efficiency in mind, it's fitting that Kari was effectively the one to take him down. Her trait is the most "spiritual", and it's also what Machinedramon lacks the most. He's (It's?) the only Dark Master to actually enslave digimon and force them to do hard labor. 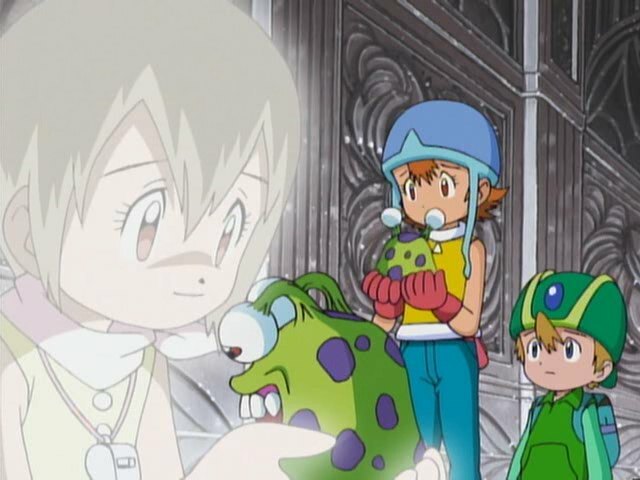 Unlike Puppetmon, he doesn't seem to have emotions or even the concept of companions. In contrast, Kari's light inspires and invigorates the beaten down Numemon, apparently because she cares so much about even the sludge monsters. Too bad she has to practically faint in the process. About the Dub and Warumonzemon. I consider it one of those moments where the Moral Guardians' attempts to make something less scary for the kids... Makes the moment more so for the adults. 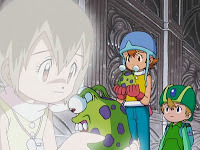 In the original, Warumonzemon just dies. In the English, he probably survived, but he went into shock at the sight of his stump and probably died minutes later from Digi-Blood loss. I thought it was more "unintentional black comedy". Machinedramon blasts him hard enough to smash windows and create fire and smoke, and moments before he disintegrates, WaruMonzaemon's last words involve fussing over his detached arm. Talk about skewed priorities.